As promised! 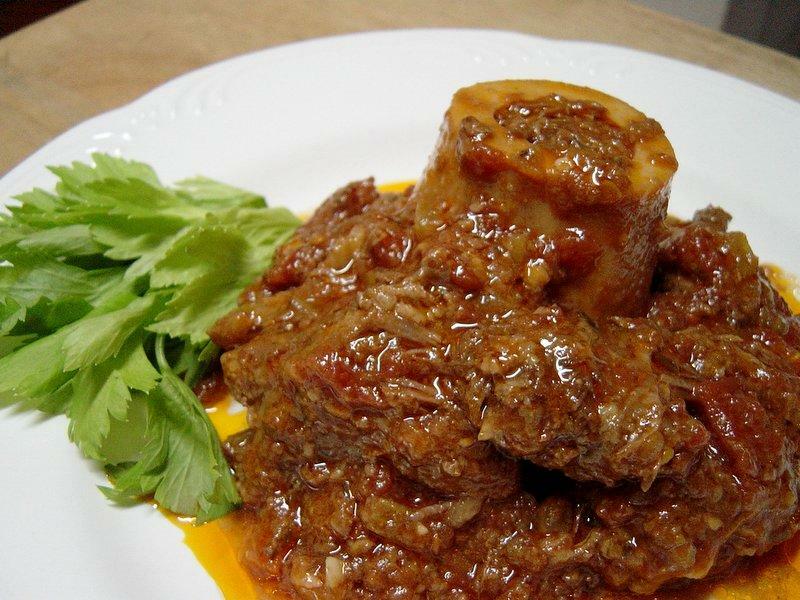 Here’s the recipe for the Osso Buco I made for my dear friend K’s housewarming gift basket. First, some background. This has been one of my mom’s signature dishes for a long time and I have never attempted to make it. I love it to bits…I love stew-y, slow cooked things, but I was a bit intimidated because of, well, the whole living-up-to-the-original thing. But this is K’s favorite dish of my mother’s and so I decided to just push up my sleeves and hazard an attempt. Unfortunately, my mom is off on her yearly NYC adventure so I had no one to badger about the details or any changes she made in the original recipe (which incidentally comes from a ratty old copy of Better Homes and Gardens Italian Cook Book), so I ended up making a lot of changes on my own. – I made a lot more sauce than the original recipe intended. We love our rice here and my brother has to have this dish with tons of sauce for slathering on his rice. – I add an inordinate amount of bones with marrow. Horribly unhealthy I know! But I just love it. And I think it adds great flavor and depth to the dish as a whole. Truth be told, K’s batch didn’t get all the bone marrow that was originally cooked in…a few went straight from the pot to my belly! But yes, cholesterol overload (story of my life), so feel free to reduce or omit as you see fit. – We add orange juice. – Sprinkle the meat with salt and pepper then dredge lightly in flour. – In a Dutch oven (I don’t have one so I use a heavy bottomed pot) brown meat on all sides in hot oil. – Remove meat and set aside. – Add onion, carrot, celery, and garlic. Cook until onion and celery are tender. – Return meat to your pot. – Stir in undrained tomatoes, wine, orange juice, bay leave, orange peel, lemon peel, beef bouillon, thyme, water, and a dash pepper. – Bring to a boil then reduce heat. – Cover and simmer until meat is tender (the original recipe says it should take 1 – 1 ½ hours but mine took approximately double that…I’m using beef not veal so that may have a little something to do with that, oh well…just cook it gently until it’s really tender). – A while into the cooking, check if extra seasoning is needed and if so, add some salt to taste (the original recipe adds the salt earlier on but I prefer adding salt, aside from salt used to season the meat, later in the cooking because of horrible salty episodes in the past). The original recipe has you remove the meat once cooked to further reduce the sauce, but we never do this step.